It looks to be a Baffle and they put an Insullation panel in the tank. The 7/70 emissions warranty recently saved me with my 2015 Audi A8 4.0T. The turbos failed (a growing problem across numerous Audis with the 4.0T engine) at 68,800 miles with the car well beyond the factory 4/50 warranty. Dealer repair would have been in the neighborhood of $10k, but Rhode Island (where the car was initially sold) is a CARB state and thus the 7/70 emissions warranty was in effect, and the repair cost me nothing out of pocket (except for the cost of the tow truck to the dealership). I spoke with the service manager today and he informed me that there was no TSB for my 2013 L405 addressing the fuel tank issue. 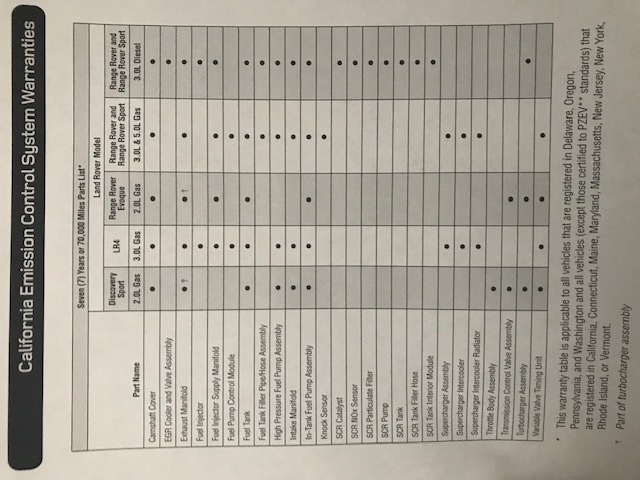 Does Land Rover have to release a TSB in order for them to cover it under the California Emission Control System Warranty? This is a long shot, but I remember a quite a while back that some were reporting the same problem, it was cause by fuel sloshing around in the Tank when it go below a certain level. It seems that you were right...I finally let the fuel level drop below half tank and I haven't heard/felt the clunk since. The tank is now near empty so my next move is to fill up and run it by the dealer to see if we can duplicate the clunk. That is for the front of the vehicle. That TSB was for the L494, L405 all motors is what I was told. Yes I know that but it is still a possibility seeing that is due to the suspension system. it is not unheard of for it to be complained about in one area but have it happen in another. Just something to look at if they have no other way to go. Besides noises are hard to locate position so seeing that his description of the symptoms are very similar it should not be ruled out. You don’t need a tsb from OE in order to file any warranty, emissions related or not. A tsb is an internal advisory system from OE to techs advising them of potential issues and the remedy, nothing more. A tsb is NOT a recall, although it can become a mandated recall if fail events become prominent. As for a fuel tank baffle coming loose inside tank, how exactly is this an emissions item? Is it causing an elevation in tailpipe emissions? If not, it is not an emissions related failure. The fix is likely a replacement of fuel tank, if in fact it is a baffle as it’s likely due to a weld failure. small clunk when accelerating from a stop??? ?